- One Secret Pack is guaranteed per box. - Every pack will definitely have one R or above rarity card! - There may be a foil version of any R/U card. - Excessive!! 100 Yen Star Dragon is the 2nd X Character Pack released in Japanese format. - Includes further support for Star Dragon World. - There will be 3 different variants of Secret Packs. - Introducing a new attribute to Star Dragon World, Cosmo Dragoon. - There is NO Common (C) in this set. - [Activate] Put two card from this card's soul into your drop zone. If you do, for this turn this card gets [Triple Attack]. When this card attacks and destroys your opponent's monster, deal 1 damage to the opponent. - At the beginning of your attack phase, search your deck for up to one card, put it into this card's soul, and shuffle your deck. - If this card is on your center, this card on the field cannot be destroyed by card effects. - All cards on your opponent's field get power-1000 and defense-1000! - If you have an originally size 3 《Prism Dragon》 on your center, reduce the size of this card by 3. - At the end of the battle that a 《Prism Dragon》 on your field was attacked, if there is a 《Prism Dragon》 in your center, deal 1 damage to the opponent. This ability only activates once per turn. - When this card is attacked, you may return this card and a monster attacking this card from the field to its owner's hand. - [Activate] Reveal the top card of your deck. If the card revealed is a 《Cosmo Dragoon》, put it into your hand, and for this turn, this card gets [Double Attack]. If it is not, put it on the bottom of your deck. You may only use this ability once per turn. - "Luna Gate" When this card enters the field, reveal the top card of your deck. If the card revealed is a 《Cosmo Dragoon》, put that card to your hand, and draw a card. If it is not, put that card on the the bottom of your deck. "Luna Gate" only activates once per turn. - If you have an originally size 3 《Prism Dragon》 on your center, this card on your left or right cannot be destroyed. - When a size 3 monster on your field is destroyed, you may put this card from your field into your drop zone. If you do, that card remains on the field. - "Tears of Rainbow Stone" During your opponent's turn, when a 《Prism Dragon》 monster on your field is destroyed, put the top of your deck into your gauge, and draw a card. "Tears of Rainbow Stone" only activates once per turn. - When this card attacks, put the top three cards of your deck into your drop zone, and call up to one monster from among them by paying its [Call Cost]. That card becomes a size 0 until it leaves the field. - [Activate] Choose a monster on your opponent's field, and you may put a card from this card's soul into your drop zone. If you do, destroy the chosen card, and you gain life equal to the destroyed monster's size. - When this card enters the field, destroy a monster on your opponent's field! - [Activate] Choose a card on your opponent's field and reveal the top card of your deck. If the revealed card is a 《Cosmo Dragoon》, destroy the chosen card, and put the revealed card on the bottom of your deck. You may only use this ability once per turn. - When this card attacks, if you have a 《Prism Dragon》 item equipped and your life is greater than your opponent's, for this turn, this card gets critical+3! - If you have an originally size 3 《Prism Dragon》 in your center, reduce the size of this card in your left or right by 3. - This card gets power+1000 and defense+1000 for each soul in card's on your field. - [Counter] [Activate] Choose another size 1 or less monster on the field, put this card from your field on the bottom of your deck. If you do, return the chosen card to your hand. - You may only cast this card if you have a 《Cosmo Dragoon》 on your field. - Look at five cards from the top of your deck, then put them on the top of your deck in any order. Draw a card. You may only cast "Fifth Focus" once per turn. - You gain 1 life, and draw two cards. You may only cast "Star Believer" once per turn. - Choose a card on your field, for this turn, that card gets power+2000 and [Penetrate]. Then, if you have a card with three or more soul on your field, draw a card, and if it has five or more, for this turn, the chosen card gets [Double Attack]. - You may only cast this card if you have a monster on your field with two or more soul. - [Counter] Choose and use one of the following two. • For this turn, the next time you would be dealt damage, it is reduced to 0. • [Rest] a monster on your opponent's field. - You may only cast this card if there is a size 3 《Prism Dragon》 on your center. - Choose and use one of the following two. • Put all soul from a monster on your opponent's field into the drop zone. • Destroy a card on your opponent's field. - The abilities of all 《Prism Dragon》 monsters on your field cannot be nullified, and they get power+1000 and defense+1000! This ability cannot be nullified. - At the end of the battle that a 《Prism Dragon》 monster on your field was attacked, for this turn, give a 《Prism Dragon》 on your center defense+1000! - When this card attacks, reveal the top card of your deck. If the revealed card is 《Cosmo Dragoon》, [Stand] this card. Then, put the revealed card on the bottom of your deck. This ability only activates once per turn. - If this card is on the center, 《Prism Dragon》 on your left and right cannot be destroyed by your opponent's card effects, and they get critical+1! - [Counter] [Activate] You may pay 1 gauge. If you do, for this turn, all cards on your field get defense+1000! - If this card is in the soul of a 《Neodragon》, that 《Neodragon》 gets attack+3000, critical+1, and [Penetrate]. - When this card enters the field, put the top two cards of your deck into your gauge. - When this card attacks, reveal the top card of your deck. If the card revealed is a 《Cosmo Dragoon》, put it into this card's soul. If it is not, put it on the bottom of your deck. - "Double Arm Bit" When this card is put into drop zone from the soul of 《Neodragon》 on your field, put two cards from the top of your deck into the gauge. "Double Arm Bit" only activates once per turn. - At the end of the battle of this card, you may put this card from the field to the bottom of your deck. If you do, look at the top two cards of your deck, put as many cards from among them on the bottom of your deck as you like in any order, and put the rest on the top of your deck in any order. - A monster in your center gets [Penetrate]! - You may only cast this card during an attack on your opponent's turn, and you have a 《Prism Dragon》 on your center. - [Counter] Nullify the attack. If you are equipped with an item, this card cannot be nullified. - You may only cast this card when a 《Neodragon》 on your field is destroyed. - [Counter] Destroy a monster on your opponent's field, and deal 1 damage to your opponent! - You may only cast this card during an attack on your opponent's turn, if there is no monster in your center, and if you have a 《Cosmo Dragoon》 on your field. - [Counter] Nullify that attack, and reveal the top card of your deck. If it is a 《Cosmo Dragoon》, add it to your hand, and you gain 1 life, if not, put it on the bottom of your deck. - [Counter] You gain 1 life, and draw a card! - [Counter] [Activate] During your turn, you may choose a 《Cosmo Dragoon》 on your field, and pay 1 gauge. If you do, reveal the top card of your deck, and if it is a 《Cosmo Dragoon》, [Stand] the chosen card. Put the revealed card on the bottom of your deck. You may only use this ability once per turn. - You may only cast if your opponent has 4 life or less, and there is a size 2 《Cosmo Dragoon》 on your field. - Reveal the top card of your deck. If that card is a 《Cosmo Dragoon》, deal 4 damage to your opponent! Then, put that card on the bottom of your deck. - When this card attacks, you may put four cards from this card's soul into your drop zone. If you do, destroy all cards on your opponent's field, and deal 4 damage to your opponent!! - If this card is in the soul of a monster with "Zodiac" in its card name, all cards on your field gets attack+1000, and defense+1000. • If there is a 《Star》 on your field, nullify all abilities of a card on your opponent's field. • If there is a 《Neodragon》 on your field, put a card from your drop zone into the soul of a monster on your field. - When this card attacks, if there are two or more cards in this card's soul, deal 1 damage to your opponent! - The 《Neodragon》 that this card is in the soul of gets power+1000! - [Activate] If this card is in the soul of a 《Neodragon》, pay 1 gauge. If you do, for this turn, that card gets [Penetrate]. Then, if there are four or more "Biggest Dragonarms, Giant Fragment" in that card's soul, for this turn, that card gets [Quadruple Attack]. - [Counter] [Activate] Choose a 《Prism Dragon》 monster on your field, then you may pay 1 gauge and pay 1 life. If you do, put this card from your hand into the soul of the chosen card. 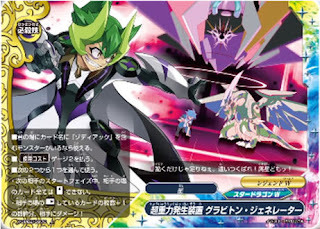 - [Activate] If you have a size 3 《Prism Dragon》 monster on your field, you may discard this card from your hand. If you do, you gain 3 life! - When this card attacks, reveal the top card of your deck. If the card revealed is a 《Cosmo Dragoon》, put that card into your gauge and you gain 1 life. If it is not, put it on the bottom of your deck. - The attack of your 《Neodragon》 with this card in its soul cannot be nullified if it is attacking alone. - At the end of the battle that your 《Neodragon》 with this card in its soul attacked, put this card from the soul into your drop zone. - When this card is put into the drop zone from the field, put two top cards of your deck into the gauge. - When this card enters the field, look at three cards from the top of your deck, put any number of them on the bottom of your deck, and put the rest on the top of your deck in any order. - When this card enters the field, put up to one 《Cosmo Dragoon》 from your drop zone on the top of your deck. - When this card enters the field, you may discard a card from your hand. If you do, draw a card. - When this card enters your field, you may put up to two cards from your hand into your gauge. - Put three cards from the top of your deck into your gauge, you gain 1 life, and draw a card. 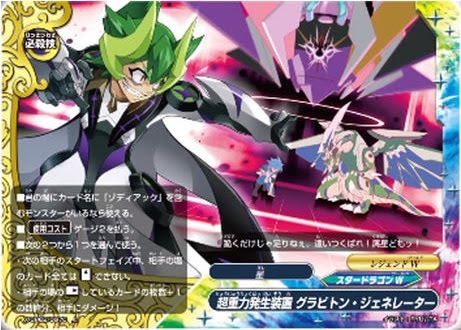 - For this turn, a 《Prism Dragon》 monster on your field can attack your opponent even if there is a monster on your opponent's center. - Put a 《Prism Dragon》 monster from your drop zone into your hand. - You may cast this card if you have a 《Cosmo Dragoon》 on your field. - Put the top three cards of your deck into the gauge. Then, look at the top card of your deck, put that card on the top of your deck or on the bottom of your deck. - [Counter] Put a soul from a card on your opponent's field into his or her drop zone, and you gain 1 life! - [Counter] Return a 《Cosmo Dragoon》 from your field to your hand or to the top of your deck. - [Counter] Choose a 《Prism Dragon》 monster in battle, and for this battle it gets defense+5000 and [Counterattack]. • Put a card from your drop zone into the soul of a monster on your field. - You may only cast this card during your opponent's turn. - [Counter] Return all size 1 or less monsters from the field to their owner's hands. - [Counter] Nullify that attack, and look at two cards from the top of your deck, put one from among them into your gauge, and one on top of your deck. - When this card attacks, look at the top three cards of your deck, put them on the top of your deck in any order. - This card can attack even if you have a monster on your center. - When this card attacks, if you have a 《Prism Dragon》 on your center, put the top card of your deck into your gauge. - [Counter] Call a size 3 《Prism Dragon》 from your drop zone by paying its [Call Cost], and deal 1 damage to your opponent! - This card's abilities on your field cannot be nullified. - If this card is in the soul of 《Neodragon》, all cards from soul of that 《Neodragon》 and this card's abilities cannot be nullified. - This card can attack even if you have a 《Star》 or 《Neodragon》 monster in your center. - When this card attacks, if you have a size 3 monster on the field, for this turn, this card gets [Double Attack]. - You may only cast this card if there is a monster with Zodiac in its card name on your field. • All cards on your opponent's field cannot [Stand] during your opponent's next start phase. • Deal damage to your opponent equal to the number of [Rest] cards on your opponent's field plus 1! - When you cast a spell during your opponent's turn, draw a card. This ability only activates once per turn. - [Counter] [Activate] "Galaxy Wave" During your turn, call a monster with "Jackknife" in its card name from your drop zone on the top of this card by paying its [Call Cost]. You may only use "Galaxy Wave" once per turn. - If your flag is "Legend World", this card gets [Penetrate]. If your flag is "Star Dragon World", this card gets [Move]. - [Counter] [Activate] "Gravity Rest" You may choose a monster or an item on your opponent's field, discard a card from your hand, pay 1 life and pay 1 gauge. If you do, [Rest] the chosen card.